The College’s general faculty voted to advise the faculties of Arts and Sciences and the professional schools to recommend to College President Phil Hanlon that he ask the Board of Trustees to create a School of Graduate and Advanced Studies at Dartmouth at the annual general faculty meeting in Alumni Hall on Monday. The assembled faculties voted 174 to nine to approve the recommendation. No faculty members abstained. The meeting began with Hanlon addressing the audience about increasing diversity in Dartmouth’s faculty and staff. Later, discussion passed to the topic of the independent graduate school. An amendment was made to the language of the motion to clarify the purely advisory nature of the general faculty vote. The proposed amendment caused a short bout of confusion over voting procedure. It was finally agreed that two votes would be held — one on the amendment of the motion’s language and one on the content of the motion. After some more careful revision of the language, the general faculty almost unanimously passed the amendment. Discussion then moved onto the motion itself. Hanlon stated that he endorsed the proposal when he initiated the conversation about the graduate school. In light of the College’s 17 Ph.D. programs, 14 masters programs and 250 post-doctorate students at Dartmouth, Hanlon said that the College needs to pay more attention to this “middle academic generation” that bridges the gap between undergraduates and tenured faculty. Hanlon identified four main reasons to create the graduate school. Hanlon said that the Trustees are interested to hear the input and advice of faculty. Provost Carolyn Dever is also in support of the independent graduate school. She pointed to the interdisciplinary graduate program ecology, evolution, ecosystems and society which, though it does not fall into any undergraduate department, would have a comfortable home in the new School of Graduate and Advanced Studies. 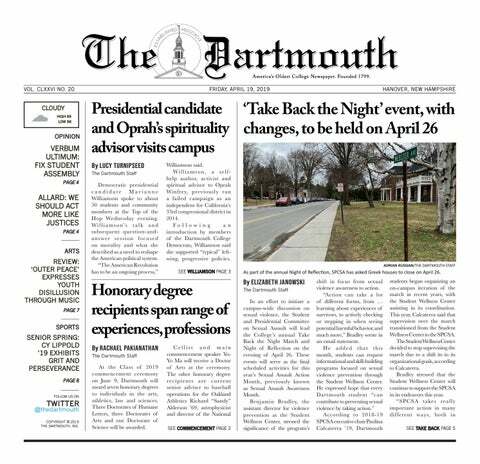 Many faculty expressed support for the graduate school as a symbol of Dartmouth being as serious about its graduate education as it is about its undergraduate education. Some said that a School of Graduate and Advanced Studies would help alleviate feelings of marginalization that graduate students at Dartmouth often have. Others said that this school would demonstrate to others Dartmouth’s commitment to research. Some faculty also expressed concerns, however, that the establishment of this new institution would reallocate resources originally dedicated to undergraduate programs. A request was also made during the meeting for greater clarity regarding what exactly was being voted upon. Dean of graduate studies Jon Kull, one of the main proponents of the project, said that the establishment of this school would make a firm statement that Dartmouth supports its graduate programs. Some additional resources would be allotted to the new school, such as more professional development activities, writing programs and support for post-doctoral fellows. “Right now post-docs can come to the things we offer only if there’s room,” Kull said. Kull also said that the creation of this independent graduate school would require changing “Organization of the Faculty at Dartmouth College” document. Biological sciences professor Roger Sloboda said that the creation of the independent graduate school would simplify the arrangement and organizational paths of reporting. He does not foresee any drawbacks. Geisel biochemistry professor Dean Madden, a member of the task force created to examine the proposal, said the creation of an independent graduate school is not the initiative of administrators, but rather administrators responding to suggestions from the faculty. Madden said that there was a strategic planning process from 2011 to 2012, under former College President Jim Yong Kim, during which faculty working groups were formed for a variety of projects. Madden was in a group called “Graduate Education for the Future” and there was another group called “Research, Scholarship and Creativity.” Both of those groups in their reports suggested forming a school or institute for graduate, post-doctoral and advanced studies. “The motivation [for this proposal] didn’t come out of the task force or the administration, it really came out of these earlier working groups,” Madden said. During the meeting, engineering professor and task force member Brian Pogue said that while some faculty may believe the proposal is being rushed through, it has in fact been under discussion for decades. “I don’t think it could happen any slower,” Pogue said. Rockefeller Center director and economics professor Andrew Samwick said he is unsure what problem is being solved by the creation of the new graduate school and what benefits are being granted by the new institute. The new school is taking “some of the administration of Arts and Sciences graduate programs away from the Dean of the Faculty of Arts and Sciences,” he said. “I think what has been proposed is an administrative response to a problem of resources,” Samwick said. Nevertheless, Samwick said he does not believe the proposal is harmful in any way. Faculty expressed satisfaction with how the meeting and vote went. “I thought the discussion was serious and thoughtful, and very positive and supportive,” Dever said. Madden was pleased with the result of the vote and as well with the faculty turnout and participation.